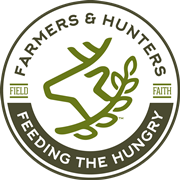 Hunger in America - Farmers and Hunters Feeding the Hungry - Hunt Down Hunger! According to Feeding America, 1 in 8 Americans struggles with hunger. In 2015, 42,238,000 people were food insecure. Food insecurity exists in every county in America. Millions of people are still struggling to get by because of underemployment, stagnant wages and rising costs of living. To these Americans, food has become an unaffordable lux﻿ury. According to the Feeding America Hunger Study 2014, 57% of client households served by Feeding America food banks said 66% had to choose between medical care and food, and 69% had to choose between utilities and food. Forty-one percent of survey cities reported that the number of requests for emergency food assistance increased over the past year. 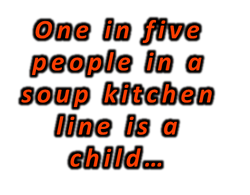 In America, 1 in 6 children may not know where they will get their next meal. For the nearly 13 million kids in the U.S. facing hunger, getting the energy they need to learn and grow can be a day-in, day-out challenge. 13.4 million children or approximately 18% of children in the U.S. lived in poverty. Although food insecurity is harmful to any individual, it can be particularly devastating among children due to their increased vulnerability and the potential for long-term consequences. Children who are denied an adequate diet are at a greater risk than other low income children of not reaching their full potential as individuals. Children who are undernourished have trouble concentrating and bonding with other children and are more likely to suffer illnesses that force them to be absent from school. They consistently perform more poorly on standardized tests. Poor performance early in school is a major risk factor for dropping out of school in later years. According to labor statistics, educational attainment is perhaps the greatest indicator of job and income mobility, so the impact of childhood hunger can be lifelong. Studies have also shown time and time again that even mildly undernourished children may potentially suffer abnormal brain, cognitive, and psychological impairment that, if not corrected, can be irreversible. In 2015, 5.4 million Americans over the age of 60 were food insecure. 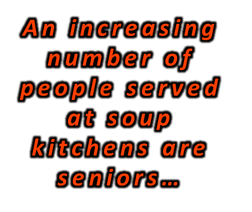 The rate of hunger among seniors aged 60 and older has increased by 53% since 2001, a lingering effect of the 2008-09 recession. In fact, the number of seniors struggling with hunger is projected to increase by another 50% when the youngest of the baby-boom generation reaches 60 in 2025. In 2016, 9 percent of seniors (4.2 million older adults age 65 and older) lived below the poverty line. In 2016, under the Supplemental Poverty Measure, seniors make up 14.5 percent of people in poverty as compared with 9 percent under the official measure. In 2016, under the Supplemental Poverty Measure, medical out of pocket expenses (MOOP) increase the poverty rate among seniors (9% excluding MOOP, 14.5% including). In the U.S., hunger is not caused by a scarcity of food, but rather the continued prevalence of poverty. To the surprise of many, most Americans (51.4 percent) will live in poverty at some point before age 65. That means any one of us - or our friends or family members - may be affected! In 2015, 8.6 million individuals were among the “working poor” according to data from the Bureau of Labor Statistics. The ​U.S. Conference of Mayors’ Report on Hunger and Homelessness (A Status Report on Homelessness and Hunger in America’s Cities, December 2016) indicated low wages led the list of causes of hunger cited by survey cities; followed by high housing costs and poverty. Many church feeding programs and soup kitchens tell us that fresh meat is one of the hardest commodities to acquire due to it's high cost ($3 - $5 per pound). It is also more difficult to donate frozen meat. Since venison is low in fat, naturally nutritious and costs about $.25 per serving, it is a perfect low cost substitute for other meats. Additionally, most venison donations go to feed the hungry in the county where the deer was harvested. By supporting FHFH, you provide the help needed to create a bridge between donated venison (a renewable food resource), and the hungry within our communities. Click here to find out more about how the FHFH ministry works.